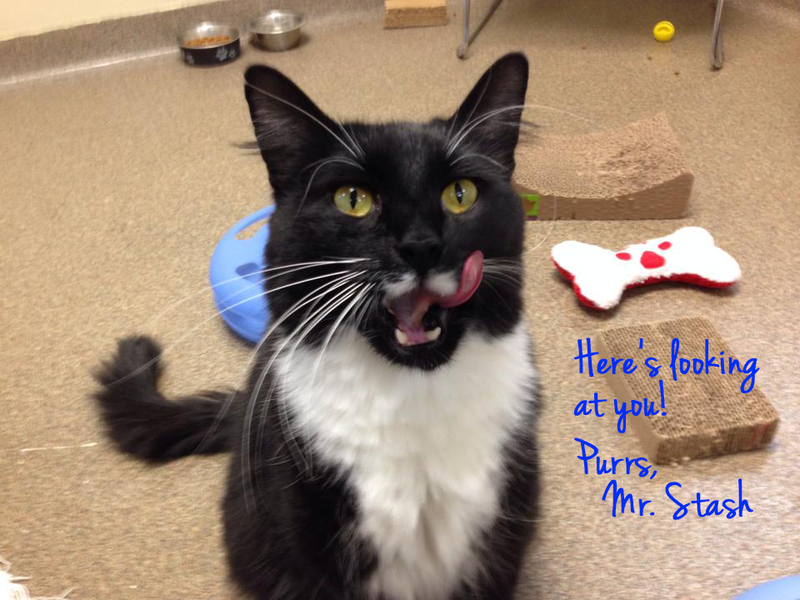 "Mr. Stash here - I have been asking for days to use the computer in the cat adoption office, and they just act like I am joking. Well today I got my chance. I have to be quick - she'll be back at any moment." "As you can see, I'm a handsome guy with a face anyone would love - especially my 'stache'. The cool thing about my mustache is it needs no special combing or waxing. I was born with it, and it stays the perfect shape and length. Do you often need a date for those big affairs? Well, I'm also low-maintenance when it comes to wardrobe -- in my black and white tux, I'm ready for any special occasion. There's no need for me to rent formalwear. I came to Wayside as a stray, and now I'm looking for that purrrfect match. I make great biscuits with my paws, and and if Wayside gave awards, mine would be "Best Kisser." Wanna pucker up and try me out? Please share my photo and story - I'm looking for a new forever family! Oops, gotta run, someone's coming! Mr. Stash is available for adoption at Allie's Alma Mater, Wayside Waifs. You are a very fun and festive guy, Mr. Stash! Isn't that, like, the cooolest 'stache EVER? Mr Stache, I hope you find your forever family. Not only is your mustache gorgeous, your whiskers are spectacular. I hope you find your forever home soon. Wow, a gentleman. Everybody wants to date one. I do hope you get adopted soon. He's guaranteed not to cuddle and tell, too! How cute and love the name. Wishing him luck. Have a Wonderful Wednesday. Paws crossed for you, Mr. Stash! You look very dashing with your little tash Mr Stash. Mr Stash you are rather good looking. Hope someone sees your handsome mug and gives you a chance at a furrever home!